Kapama Private Game Reserve occupies a vast area between Northern Drakensberg mountains and Greater Kruger National Park. 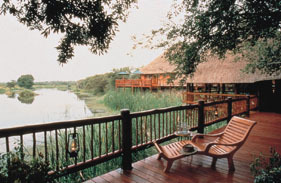 It?s the largest single-owner game reserve in the region, and is perfectly situated to receive guests flying into Eastgate Airport (Hoedspruit). This airport is just minutes from the reserve and Kapama include free airport transfers direct to any of the four lodges: Kapama Lodge, Kapama River Lodge, Kapama Buffalo Camp and Kapama Karula. These lodges can accommodate a total of 208 people between them. Kapama Game Reserve consist of 13000 hectares, based in Limpopo Province and has all the big 5 of Africa with 42 mammal species and approximately 350 bird species. Off R40 Hoedspruit Road, Limpopo.